Minimum order of 50pcs required. A one time $5.00 Oversize Item Surcharge will automatically be applied to orders under $250.00 that contain any 24" long wood product. Not enough in stock? Your order will trigger production of this item. You will earn 1 WayPoints for each product that you purchase. No need for pre-packaged stripwood? Order strips in bulk and save over 40% off the packaged price! Additional discounts for large orders. Fast Tracks now produces all Mt. 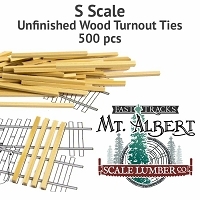 Albert Scale Lumber products! Same exceptional quality, now available online. Mt. 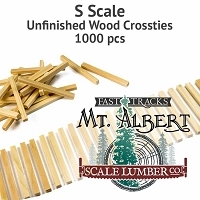 Albert scale stripwood is produced from the highest quality basswood available. Cut to consistent dimensions, with a tolerance of +/- .003" (less than the thickness of a sheet of paper) this material is ideally suited for all types of scratch building projects. Our method of cutting basswood produces clean, fuzz-free wood strips that are ready to use. We use the finest raw materials available, free of knots and discoloration. These S scale, 12"x24" strips are sold in 24" (610 mm) long pieces. Each strip is 128 S scale feet long (39 S scale meters). NOTE: This product was sold under the part number B250B24 in the Mt. Albert Scale Lumber catalog. The Fast Tracks part number for this product is now STB-S-12x24-24. Important information about shipping 24" long material. Adding any 24" long material to an order will incur an additional shipping surcharge as this length of material is more expensive to ship. Unless you need material 24" long for your project, consider ordering the 16" size by clicking here. Model Size Imperial 0.188" 0.375"
Fractional size (if applicable) 3/16" 3/8"